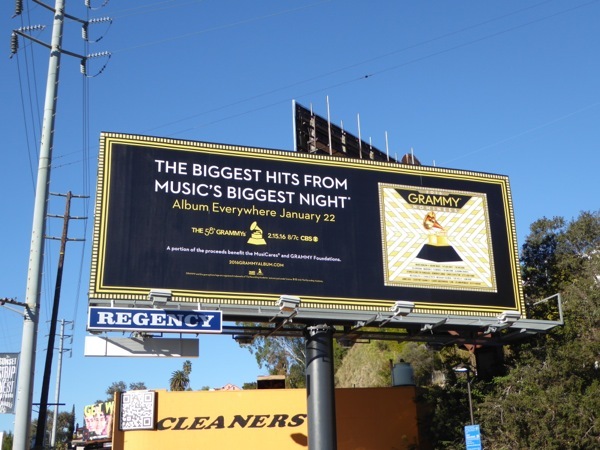 Hollywood may be in the midst of movie and TV awards season, but tonight the music industry gets set to raise the roof and party the house down with The 58th Grammys. 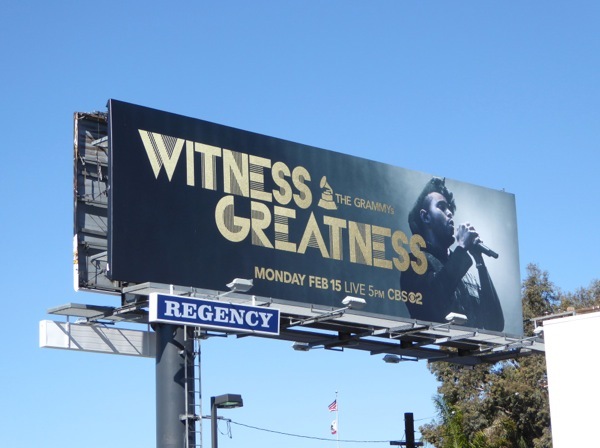 This year the Recording Academy's outdoor ad campaign for the annual awards ceremony is 'Witness Greatness' and features top names in the music business like Bruno Mars, Kendrick Lamar, Sam Smith, The Weeknd and Lady Gaga (many of whom are nominated this year). 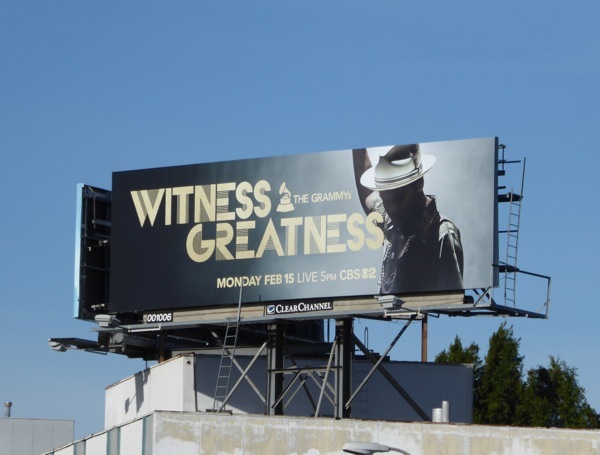 LL Cool J hosts the festivities for a fifth year in a row, and the telecast promises performances from Taylor Swift, Justin Bieber, Adele and Lady Gaga paying tribute to the legendary David Bowie. 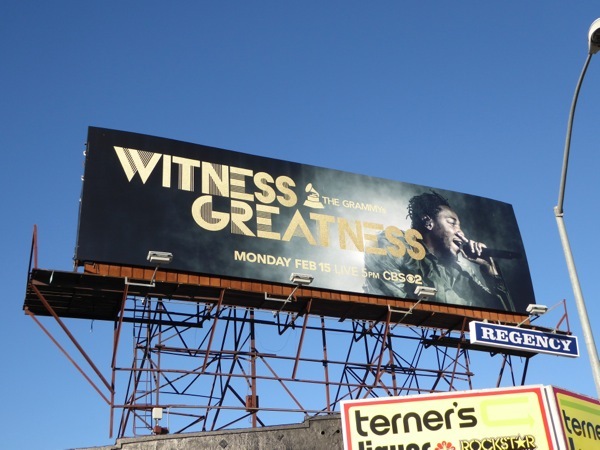 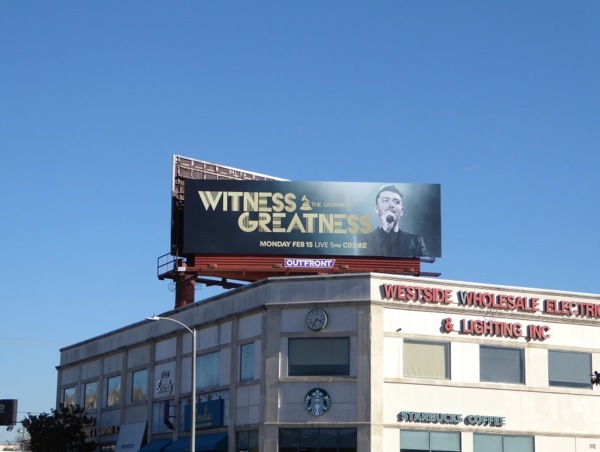 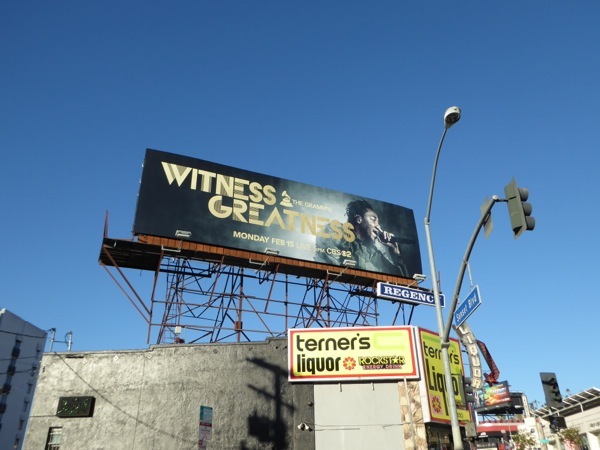 These Witness Greatness billboards and posters were snapped around the streets and skies of L.A. from January 20 to February 5, 2016, including along the Sunset Strip, Melrose Avenue, Beverly Boulevard and La Brea Avenue. 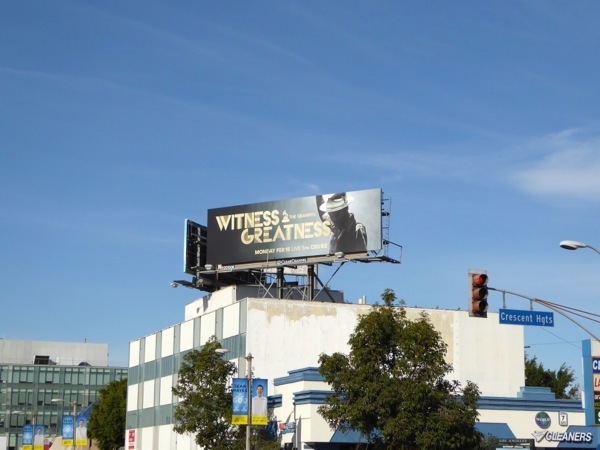 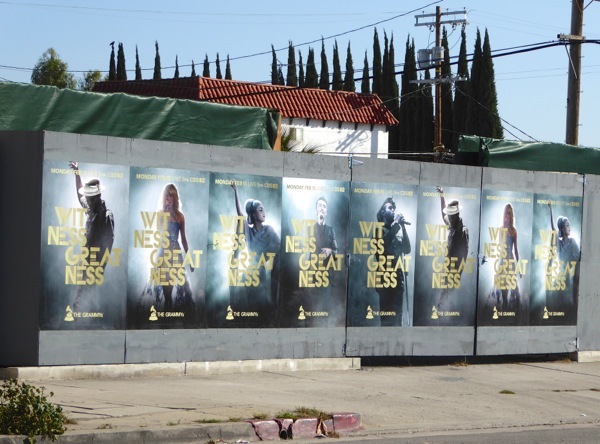 In addition this 2016 Grammys album billboard, featuring tracks by this year's nominees, was spied along West Hollywood's Sunset Strip on January 25, 2016. 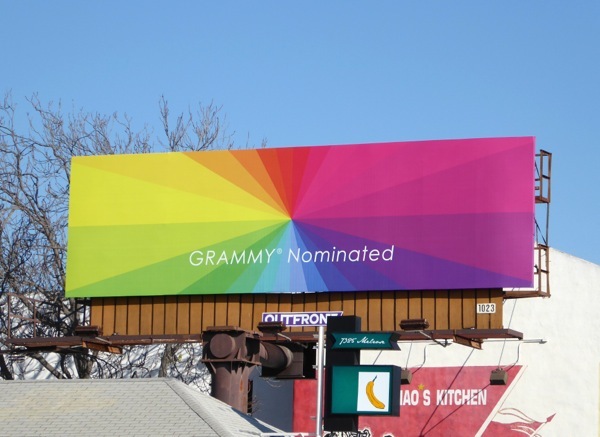 Plus earlier in the year this colour spectrum Grammy Nominated billboard was spotted along Melrose Avenue on January 8, 2016. 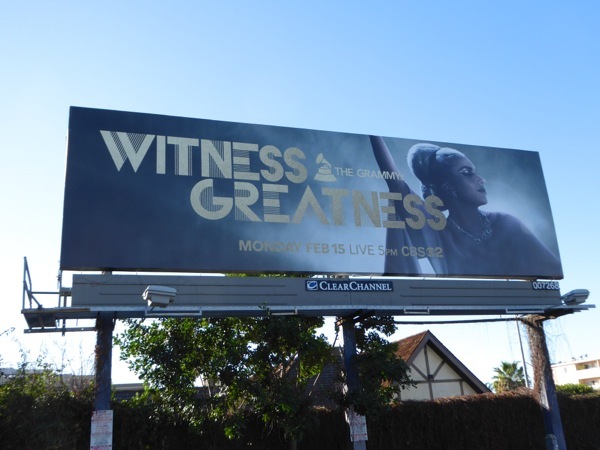 If you're a fan of the music industry awards show, be sure to also enjoy these previous Grammys billboards from years past, featuring the likes of Pink, Rihanna, The Foo Fighters, Lorde, Beyoncé and more besides. 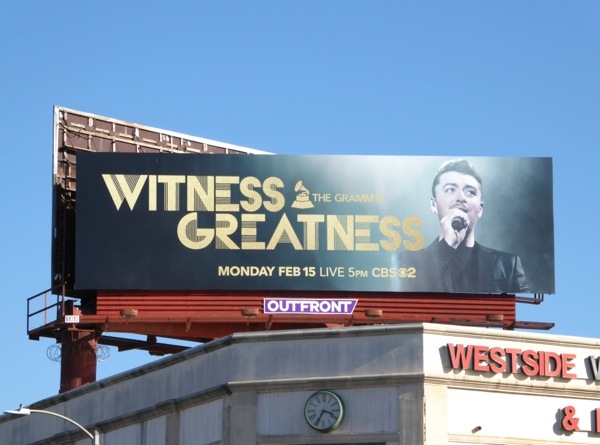 Meanwhile you can also check out this Sam Smith album billboard and these Lady Gaga outdoor ads here at Daily Billboard. 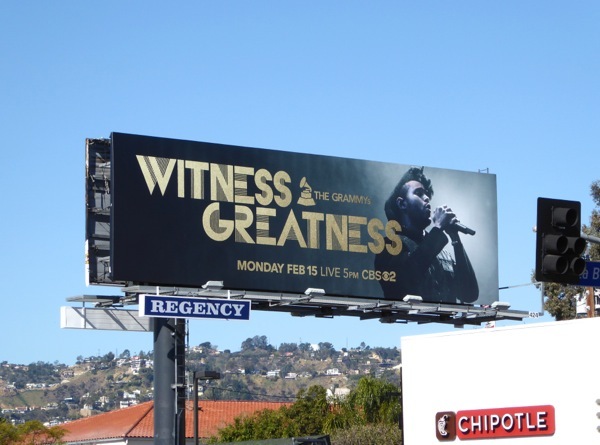 Now, will you be watching and listening to Music's Biggest Night this Presidents Day?